With three quarters of the season over we are still charging forward while battling tricky race weather conditions. 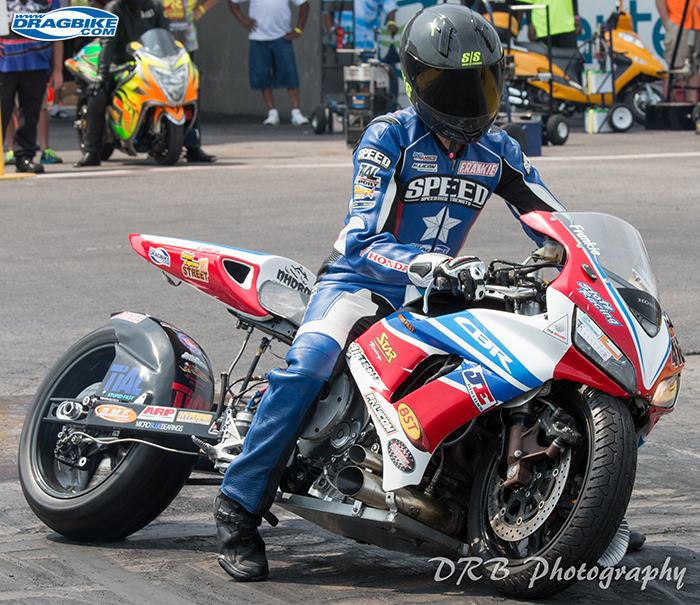 On our last race report we made it to the finals but fell short. With us being the smallest motor in the class we are pushing the breaking point of every component that makes this bike run. Innovation is the key to the next step. With that being said we are on the verge of converting all our bikes to running on alcohol. We have completed our first ever grudge bike which we have been out testing and have been getting amazing feedback from the new ECU and the fact that it runs on alcohol which we can apply to the Pro Street bike for the new rules this season. Our race in St. Louis ended with a first round loss to do racing on a brand new tire we have never used before. With that said we were bound to run into issues racing a new for us tire on a super-hot race surface. I guess this race will be the one we get to throw out. 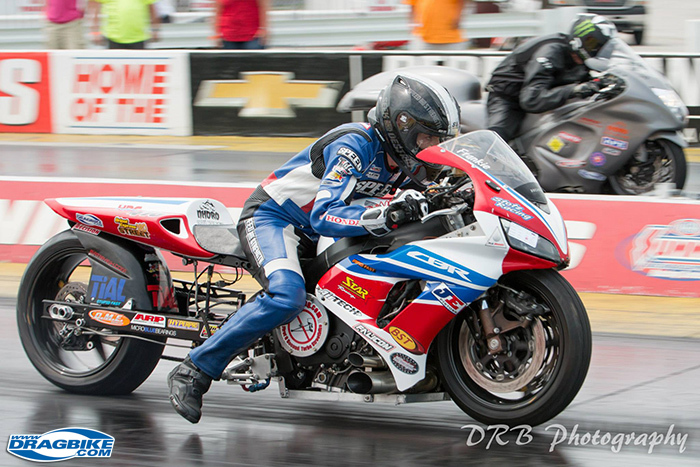 We can only use 4 of the 5 races for points in the NHDRO racing series. Having to deal with a first round loss is terrible for the fact that it hurts you in the long run for the championship. Heading to Louisville we were racing at an 1/8 mile track where our bike is best suited. With it being super hot and a hot race surface we were plagued with tire issues, until we found that hook up combo in the 1st round. We got past first round but then had the number 1 qualifier Bud Yoder in the other lane. Frankie cut yet again another amazing light but then had a motor failure as soon as he clicked into second gear. Heading to Indy we were feeling good knowing we had been testing and everything we did seemed to work for the better. Saturday came and it was time for qualifying. We ended up qualifying 5th by the end of the day. Only to hurt the crank on our last qualifying pass. With not having a spare motor our weekend was over. But we had lady luck on our side and Sunday rolled around and so did the rain. 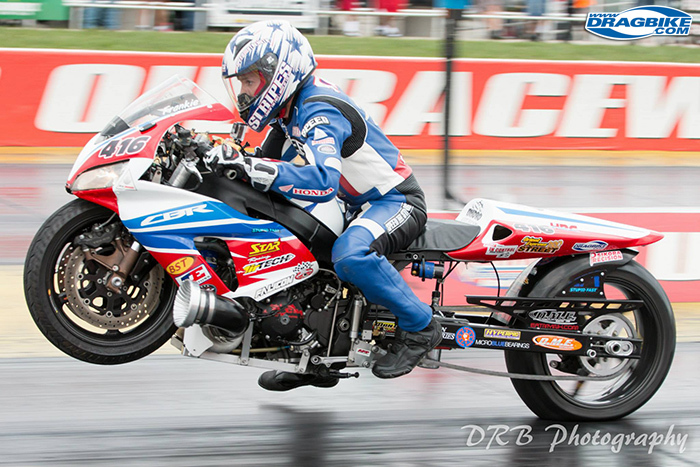 Since the rain came the race will be finished at the last race of the NHDRO series in Indy. The 2 cranks that broke had over 200 passes on each crank. That is remarkable considering we are putting close to 500 horsepower to a light weight crank that was designed for 200 HP max! Falicon reworked another stock crank rite away but when the cranks broke they took out the valves in the heads. We should have both motors with new parts in and tested long before the last NHDRO race at Lucas Oil Raceway Sept. 26-27. Hope to see you there!